Part II - Evidence Support Evolution & Dinosaurs Lived With Man? The seminar was presented in English and translated to Russian as it was presented. We are praying that we will be able to raise enough money to have these pages translated to Russian, plus fund the purchase of Russian language creation books we can send or bring to Russia. While in Dimitrovgrad Pastor Pavel told me that he knew of no web sites in Russian that present creation information. In Russia, as in American schools, nothing but evolutionism is taught. Some people had never heard the information presented in this seminar. And unfortunately this seminar only scratched the surface of a huge mass of information about creation that could be made available on the internet in Russian. The translators who worked with us in Dimitrovgrad can translate this information. We can have a Russian language creation web site. But, it takes money. People in Russia are living on the edge and it takes all their time just to earn enough money to get by. If we can raise enough money to pay a translator a couple of hundred dollars a month, we can get a Russian language creation web site online. Please help us get creation information to Russians so they can learn the truth about our world, where we came from, the Bible and Jesus. If you can support our Russian ministry on a monthly basis, or if you'd like you can contact us by email please click here. All donations are fully tax deductible. We are a 501(3)c nonprofit corporation. 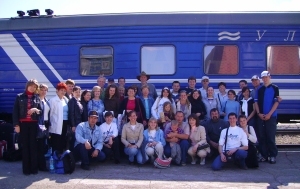 This photo shows our mission team, including our translators, the local Dimtrovgrad pastors and some friends. In addition to the creation seminar our team was involved in a four-day general evangelism effort, sports outreach, medical outreach, orphanage ministry, home visits and other ministry areas. This team went to Russia with East-West Ministries International.